The first settlement began in 1847 when 20 families from Missouri moved here at the confluence of Henriette and Denton Creeks. Louis and Charles Medlin were the leaders of the group and the community was first known as Medlin Center. Plagued by high water from the overflowing creeks, the community located on higher ground in 1879 where it underwent a change of name. It was then known as either Garden Center or Garden Valley. The Texas and Pacific railroad arrived and bypassed the town, resulting in the formation of Roanoke or Rawranoke - two spellings but both named for the city in Virginia. The town of Elizabethtown, which had also been bypassed, brought its post office to Roanoke along with most of its people. By the time of the 1890 census, Roanoke had a respectable 350 residents, nearly all of them from the bypassed towns. Roanoke, with its instantly inherited businesses, was practically guaranteed success. By 1914 the Roanoke population was nearing 500 and the town had its own newspaper, a bank and a grain elevator. 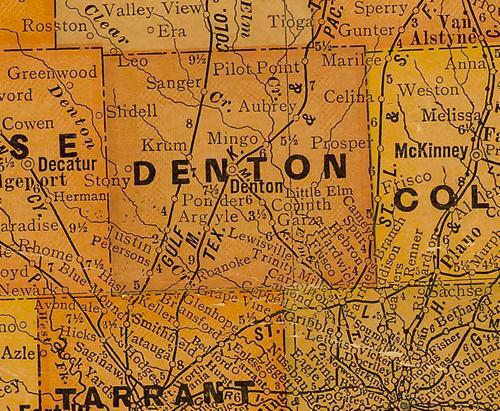 In 1940, the year Texas shifted from a rural majority to a urban majority, Roanoke was still fifteen residents shy of reaching 500. The early 1960s showed a small increase to 585 but it was the 1980s when commuters from Dallas and Ft. Worth saw it as a refuge from big city woes. In 2000 the population was nearing 3,000.